A compilation of mainly classical (plus some pop) tracks from Tony Palmer’s extensive catalogue of award-winning films at a great price, with performances by Paul McCartney, Maria Callas, Nicola Benedetti, Anne Sofie von Otter, Renée Fleming, Howard Goodall, Valentina Igoshina, Valery Gergiev and many more. 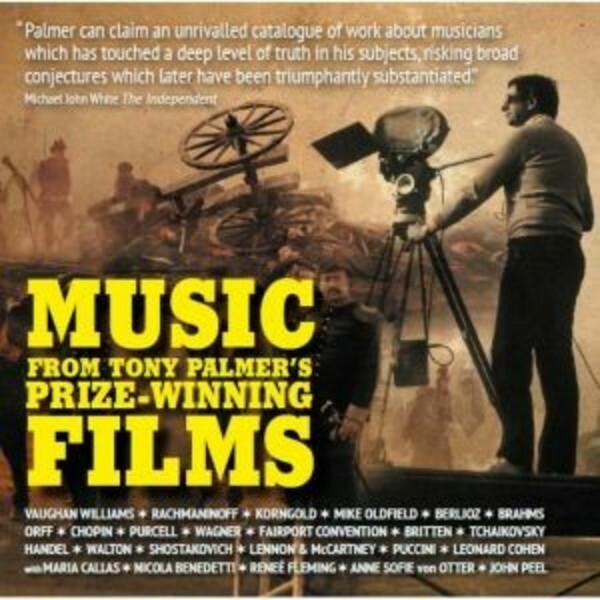 Tony Palmer’s vast filmography of over 100 films ranges from early works with The Beatles, Cream, Rory Gallagher, Jimi Hendrix and Frank Zappa, to the famous portraits with and about Walton, Britten, Stravinsky, Maria Callas, André Previn, John Osborne, Leonard Cohen (‘Bird on a Wire’), Margot Fonteyn and Menuhin, as well as feature films such as ‘Testimony’, starring Ben Kingsley as Shostakovich. His epic film on Wagner, starring Richard Burton, Laurence Olivier and Vanessa Redgrave, was described by the Los Angeles Times as “one of the most beautiful films ever made”. Among over 45 international prizes for his work are 13 Gold Medals at the New York Film & Television Festival, awards from the Jerusalem, San Francisco, Sao Paolo, Sofia, Cuenca and London Film Festivals, as well as numerous BAFTA (British Academy of Film & Television) Emmy and Grierson nominations and awards. 19. Dmitri Shostakovich: Piano Concerto No.2, 2nd movement.